The NFL has been quiet on sports betting for years. 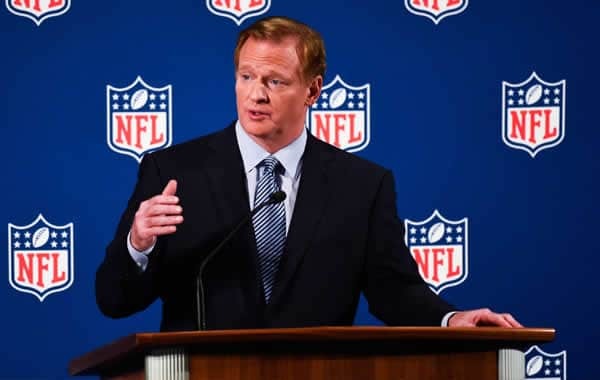 Commissioner Roger Goodell would occasionally comment on the prospect of legalized sports betting and how the NFL would approach it but nothing was ever concrete. Now, in the wake of the monumental SCOTUS decision that saw PASPA repealed, the NFL has spoken up on what it expects out of legal regulated sports betting. Goodell revealed his hand by announcing that he would be meeting with team owners to discuss how legal betting could play out. The Commissioner said in a statement that they have spent “considerable time planning for the potential of broadly legalized sports gambling.” Their main focuses are on education and compliance training for all stakeholders involved in this new betting industry. They want to provide consumer protections that uphold the integrity of the league, just like the NBA and MLB have been asking for. The interesting part of the NFL’s statement is that they ask Congress to impose federal regulations to provide uniformity throughout the country. The NFL outlined 4 major points with their regulation proposal. As previously mentioned, they want extensive consumer protections. This is an obvious demand and one that is hard to refute. Everybody wants transparent and honest betting. The second item is they want sports leagues to be able to own content and intellectual property. This is the data exclusivity that the other leagues have been petitioning for. Also, they want official league data used to determine betting outcomes. The fourth demand is they want law enforcement outfits to be able to monitor and enforce the betting market in search of illegal activity. Let’s dissect what the NFL is asking for. The fact that they want official league data extends beyond the mere argument that it is the most reliable data out there. What the NFL isn’t telling you is that all the new brick-and-mortar sportsbooks that pop up will have to pay to license that official data. Nevada sportsbooks do not abide by such a rule, but the states that haven’t gotten their sports betting legislation off the ground yet will have a difficult time denying the sports leagues their demands. The part about giving law enforcement the tools to enforce betting seems admirable, but there could be another side to it. The NBA and MLB have asked for something similar in turn, only they want to be compensated directly in order to provide better quality assurance checking. These are where ‘integrity fees’ come from. Perhaps the NFL could be leaning towards something similar, but this is mainly rooted in the thought that the NFL would never actually do something that didn’t benefit them directly. Speaking of integrity fees. It is reported that the NFL does not want them. It is probably due to the backlash the NBA and MLB have been receiving since they proposed a 1% fee of all gross bets placed. The NFL may be trying to capitalize off the distrust towards the other leagues in order to foster its own trustworthiness. One of the best arguments coming out of the NFL is that integrity fees are counterproductive to the end goal of converting Americans from offshore sites to US-based sports gambling operators. Imposing obnoxious fees on domestic operators will put them out of business before this can be achieved. None of this may come to pass, but the NFL has actually laid out a semi-decent proposal for sports gambling. The data exclusivity point is annoying given the sheer amount of data available, but it looks to be unavoidable. As long as what the league is asking for doesn’t jeopardize states’ markets, there should be no issues.